I rarely drink or smoke. The last time I had a drink was more than six months ago. Don’t even remember the last smoke. Addiction has not been a problem for me. Or so I believed. Until I heard Eckhart Tolle point out my biggest addiction – Thinking. That was a rude shock. Not only was I not aware of the incessant, involuntary and repetitive thought patterns going rounds in my mind, I considered thinking to be my greatest asset. How did I get convinced about this addiction? And, what have I done about it? Let’s see in brief. What’s wrong with thinking? Well, thinking per se is not bad. Thinking enables me to help my clients and improve the process of innovation in their organization. Thinking helps me plan and solve problems – individually and collaboratively. However, this useful thinking forms only a portion of the overall thinking that is going on. 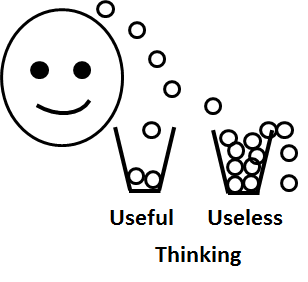 What is an example of thinking that is not serving a useful purpose? Again, there is nothing wrong with each of these thoughts. In fact, a thought like “Will my workshop go smoothly tomorrow?” may lead to an action that improves the design of the workshop. However, the problem starts when these thoughts start repeating themselves and create a snowball effect. The story in the head becomes a full-fledged movie being played in the repeat mode without any commercial break. What percentage of my thinking is useful? Well, I don’t have a scientific answer to this question. But Eckhart claims it to be a tiny percentage, say less than 10-20%. However, the fact that I am dissipating a large portion of my energy for non-useful activity is not the main reason I started looking at it closely. The repetitive negative thinking causes psychic pollution. It affects everybody around me. When I bring anxiety home, I am affecting everybody at home. And then it affects the people I send Whatsapp and Facebook messages to. It has a huge multiplier effect. Which one causes more pollution, my car or negative thinking? Again, I don’t know. But knowing the power of network effect, I won’t be surprised that the psychic pollution beats the car pollution hands down. OK. So what do I do about it? Well, I am still experimenting. Last year I wrote about the practice of Attention-Alertness-Acceptance, the Vipassana (mindfulness) meditation and catch-me-if-you-can experiment. I hope to continue with this experimentation and see where it leads. No matter what happens, I am enjoying the experimentation. Eckhart talks about thinking as the worst addiction in the popular video: How do we break the habit of excessive thinking? 10-20%: Eckhart says, “Mind is a torture instrument 80% of life” – in the interview “Conversations on compassion” at Stanford by Dr. James Doty (The quote is at: 12:10).